(Allentown, Pa.) -- Dusty Wathan -- the winningest manager in Reading (AA) history -- has been named manager of the Lehigh Valley IronPigs for the 2017 season, as announced by Philadelphia Phillies' General Manager Matt Klentak. Wathan becomes the fourth manager all-time for the IronPigs, following Dave Huppert (2008-10), Ryne Sandberg (2011-12) and Dave Brundage (2013-16). 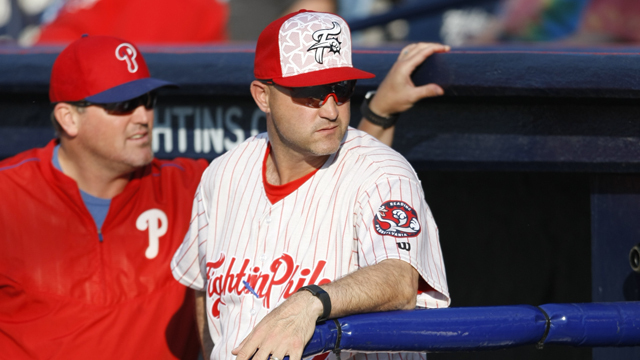 In 2016, the 43-year-old guided the Fightin Phils into the Eastern League playoffs by winning the Eastern Division title with a 89-52 (.631) record - the second-best mark in all of full-season Minor League Baseball behind the International League's Scranton-Wilkes Barre RailRiders (91-52, .636). For his efforts, Wathan was named EL Manager of the Year for a second consecutive season. Overall, Wathan owns a 631-565 (.528) record in 1,196 career games over nine seasons as a skipper in the Phillies system with SS-A Williamsport (2008), Low-A Lakewood (2009), Advanced-A Clearwater (2010-11) and Reading (2012-16). The Jacksonville, Fla., native piloted Lakewood to the 2009 South Atlantic League Championship and was named SAL Manager of the Year. In his five seasons with the Fightin Phils, Wathan posted a 373-335 (.527) record and led the team to the postseason in 2012, 2015 and 2016. Wathan began his playing career after being signed by the Seattle Mariners as an amateur free agent in 1994 out of Cerritos College (CA). He went on to appear in more than 1,000 minor league games during his 14-year career, which included stops in six different organizations: Seattle (1994-2000), Florida (2001), Milwaukee (2002), Kansas City (2002), Cleveland (2003-05) and Philadelphia (2006-07). In his brief ML career, Wathan played in three games with the Royals in 2002 and finished 3-for-5 with a double, RBI and a run scored. He recorded an RBI-double in his first ML at-bat against Detroit's Jeff Farnsworth on Sept. 24, 2002, at Kauffman Stadium. During his minor league career, the catcher/first baseman batted .273 with 58 home runs and 417 RBI in 1,019 career games. Wathan spent parts of five seasons in the IL with Buffalo (2003-05), Scranton-Wilkes/Barre (2006) and Ottawa (2007) and still holds Buffalo's single-season, franchise record for RBI (9). Of note, he was the final out recorded in Ottawa Lynx history after grounding out to Syracuse second baseman Ryan Roberts on Sept. 5 to end the 2007 season at Lynx Stadium. Wathan is the son of former major league catcher/manager John Wathan, who spent his entire playing career with the Kansas City Royals (1976-85) and was a member of the 1985 World Series Champion Royals after being selected by the team as the fourth overall pick in the 1971 MLB Draft. Over his 10 seasons, the elder Wathan batted .262-21-261 in 860 career games. Following his playing days, John spent parts of six seasons as a manager with the Royals (1987-91) and California Angels (1992), compiling a record of 326-320 (.505). During his tenure, he managed MLB Hall of Famers George Brett and Bert Blyleven, MLB/NFL All-Star Bo Jackson and former major league pitcher/manager Bud Black, among others. Dusty's brother, Derek, played parts of 11 MiLB seasons as an infielder/outfielder and hit .261-45-419 in 1,060 career games. Wathan currently resides in Charlotte, N.C., with his wife Heidi and their four children, Elle, Gus, Huck and Maeve. Wathan replaces Dave Brundage, who departs Lehigh Valley with the highest win total (286) in IronPigs history. Brundage guided the IronPigs to a 286-289 (.497) record in his four seasons and a trip to the 2016 Governors' Cup Playoffs after posting the best single-season record in franchise history at 85-58.